This is the second of my Friday night posts for my comics class. If you’re not in the class, don’t worry, this is for you too! I hope these posts will be interesting and informative for anyone who’s interested in the basics of comics (my class is called Comics for the Curious Beginner), and cause you to spend the entire weekend drawing comics! I’m collecting them in a new tab in the blue menu over on your left, so that you can read them all in one convenient place. Yesterday we talked about character design, so that’s what this week’s post is going to be largely about. Part of this was already in the handouts, but I’m going to expand on that and show some illustrations. At the bottom will be supplemental links, which I highly recommend checking out — I can’t buy you all the books I’d love to share with you, but I can point you to the free information on the wonderful world of the internet! 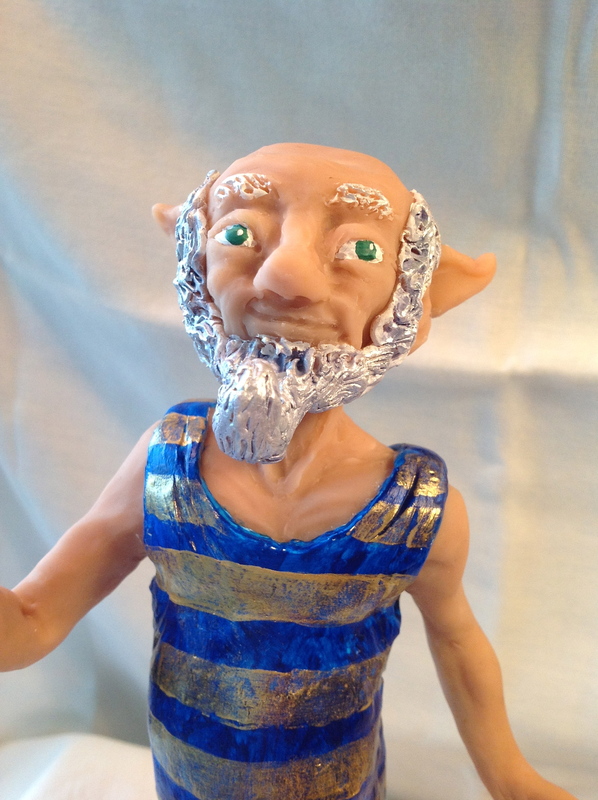 The professor started life as one of a series of sketches of techno-fay — sort of steampunk elves. They had magic, technology, and nature, and used it all. More techno-fay. 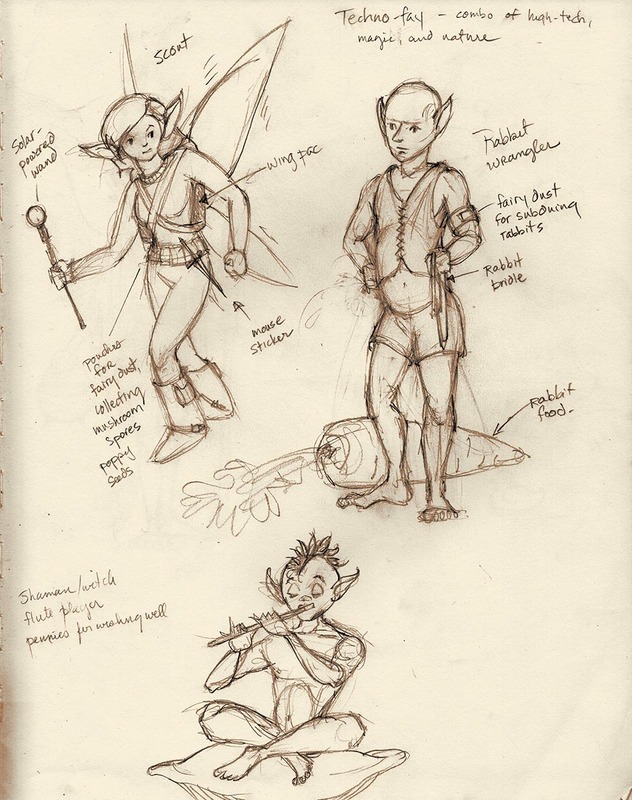 I brainstormed stuff about their equipment and occupations in writing as I drew them. Comics are all about communicating clearly. How your characters are drawn affects what they are telling your audience. Their facial expression, their body type, their gestures, what they are wearing, even the style in which they are drawn, all contribute as much to what they are saying as the words in the balloon. Be aware of body language. Watch people in real life, and in movies and TV. Turn off the sound (or watch people from a distance) and see if you can tell what they are talking about and feeling. A great deal of this is universal to our species, a language we are born with. 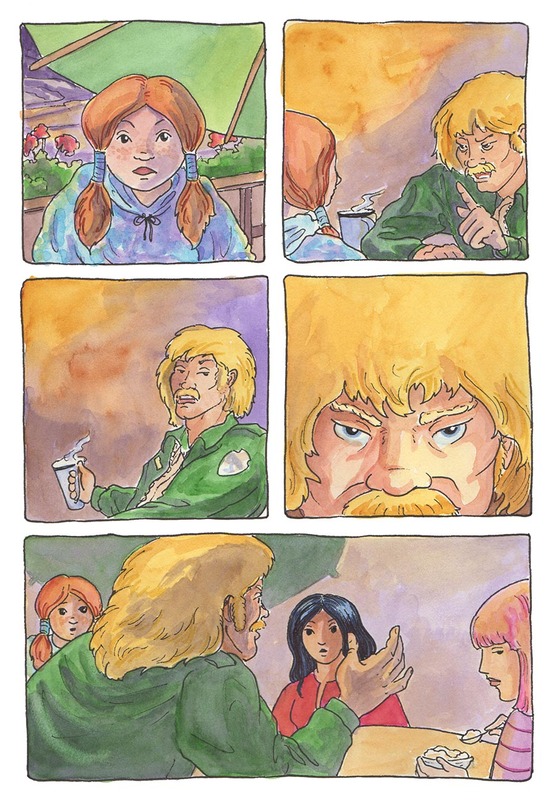 Here’s a page from Spam and the Sasquatch, without the words. Can you tell what is going on here? It’s also important to know what your characters look like from many different angles. It’s a common procedure to do a character sheet (also called model sheet) for characters that you are going to use throughout a story. Draw your characters from several angles, front, side, and back. A three-quarter view is also useful, as are views from high and low viewpoints if you are going to use these views in the story. 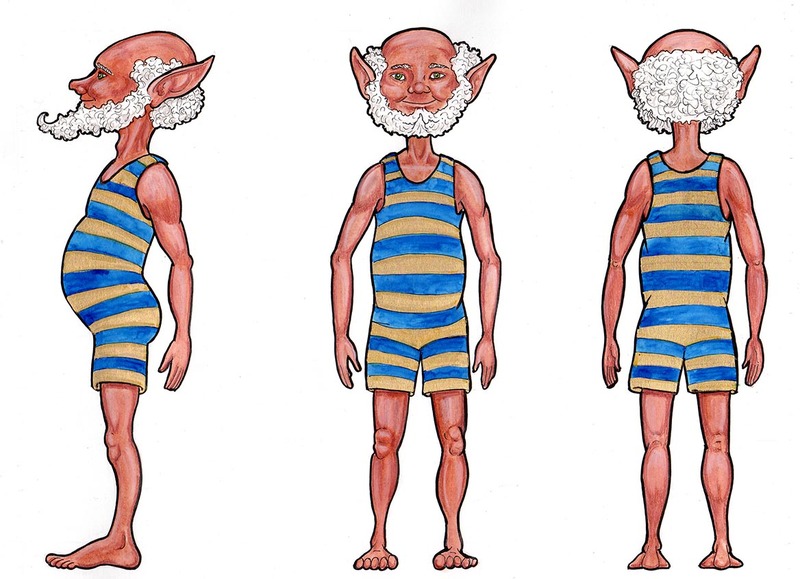 Professor O’Gumfry is an elf wizard in an 1800s bathing suit (don’t ask). Here’s his character sheet. 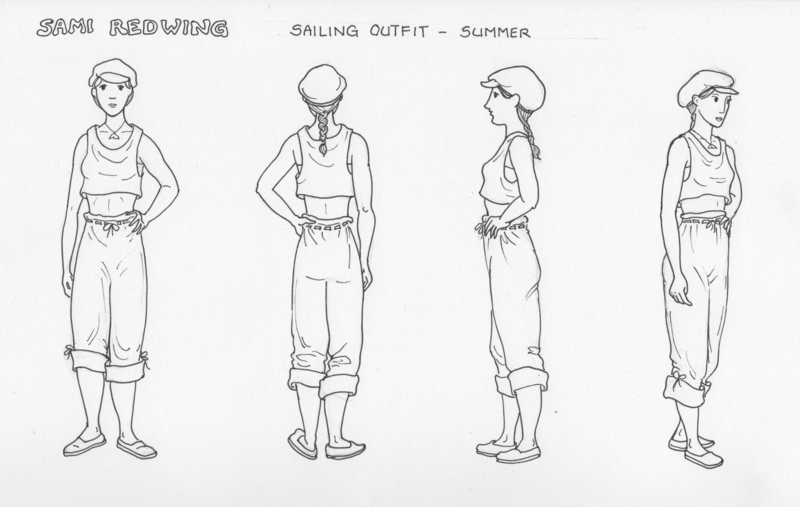 Here are some character sheets I did for Sami Redwing, one of my characters from The Mermaid. The first is a very basic drawing of her general shape, to get her proportions. Her head is a little large for her size; that was deliberate, as I wanted to make her look young and innocent, but still near-adult. 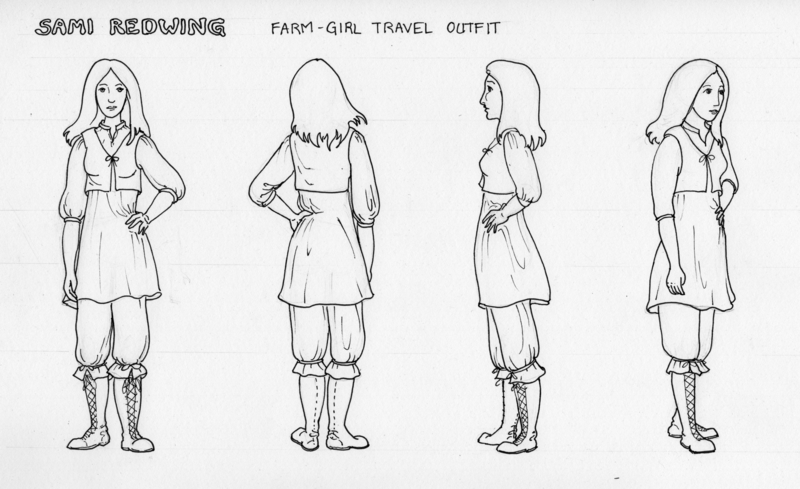 Then I got to do some fashion design; she has two outfits in the first part of the story, so I traced her basic outlines in pencil onto other sheets of paper, using a lightbox (hint: tape your paper to a bright window, works just as well! ), then drew the outfits. Kind of like having a paper doll to design clothes for! This is the basic Sami figure drawing. She’s a young woman in her late teens, slightly built but strong from farm work. 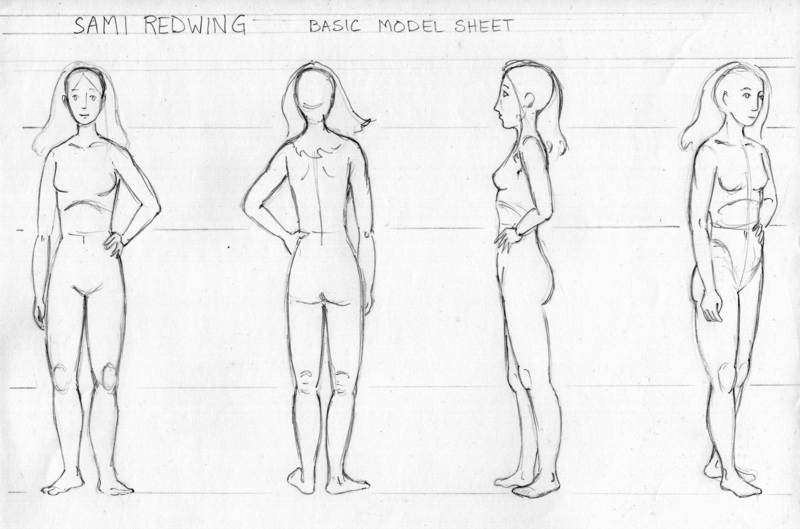 I only needed to make a basic structural drawing here., just enough to hang her clothes on. Sami’s farm is high in the hills, a bit cooler than the city and sea. This is her “nice” outfit, for doing business, but not her ‘sunday best”. Her leather vest keeps the loose linen shirt from flopping too loosely, her breeches are comfortable for walking, and her boots are sturdy. This is Sami, dressed to go to sea (that’s a bit of a spoiler, but not too much). Her costume is practical for hot weather, loose but not apt to get in the way. The pants roll down for cooler weather . Her shoes are canvas coated with a kind of flexible tree sap, like rubber. Update: you can see Sami in colour in the next post! Doing character sheets before you start your story enables you to play around with what your character looks like, and once you’ve established that, to get comfortable drawing him or her. These sheets also serve as a reference to use throughout the drawing of your story, ensuring that the character doesn’t “evolve” out of recognition as the story goes on. Another way of getting to know your character’s structure is to build a character maquette. Here’s one I did for Professor O’Gumfry; he was actually the first one I made, and I still love him! If you want to know how he was made, here’s a link to the album on my Facebook artist page. I built a character maquette next out of polymer clay. you can read about the process here. Whenever I build a maquette, I find that by the time I’m done making it, I don’t need the reference much; something about building a three-dimensional representation helps me internalize the structure better than doing a drawing. However, if I’ve got tricky lighting, I can light him from whatever angle I choose and get the shadows right. Of course he can’t move, so I have to extrapolate that. 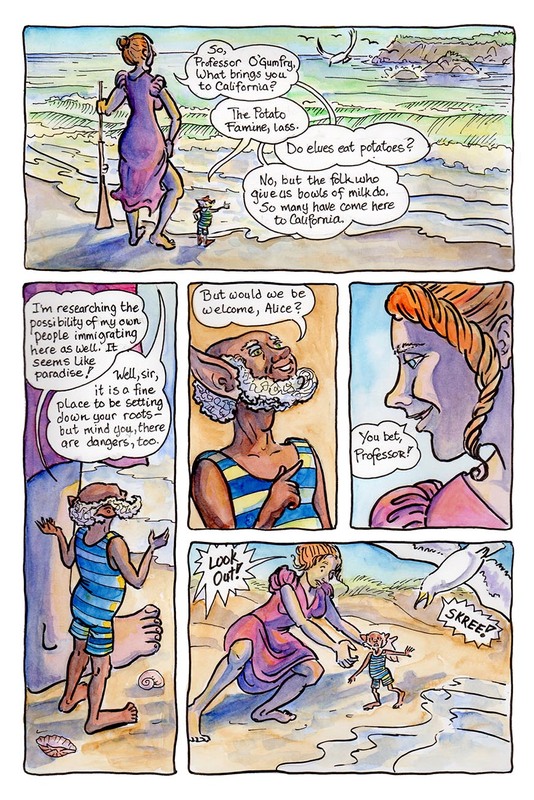 And here’s a little one-page comic I made with the Professor and his friend Alice. They will eventually get a longer story! 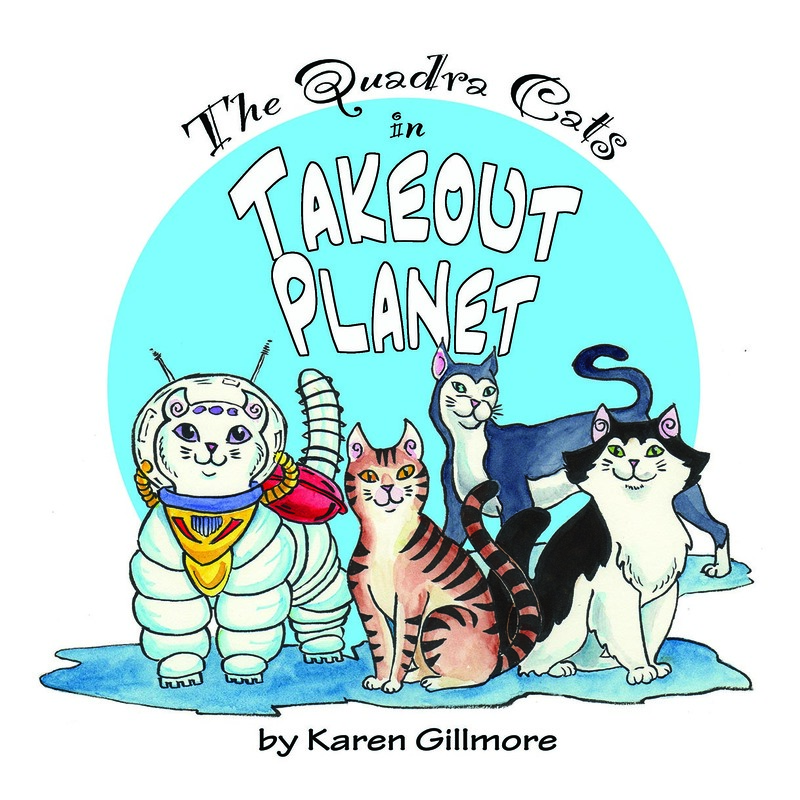 When drawing multiple characters in a story, it’s important that they be readily distinguishable from each other. Make them different sizes and shapes, varying colours (hair and skin), with unique facial features. Give them different clothing and accessories. 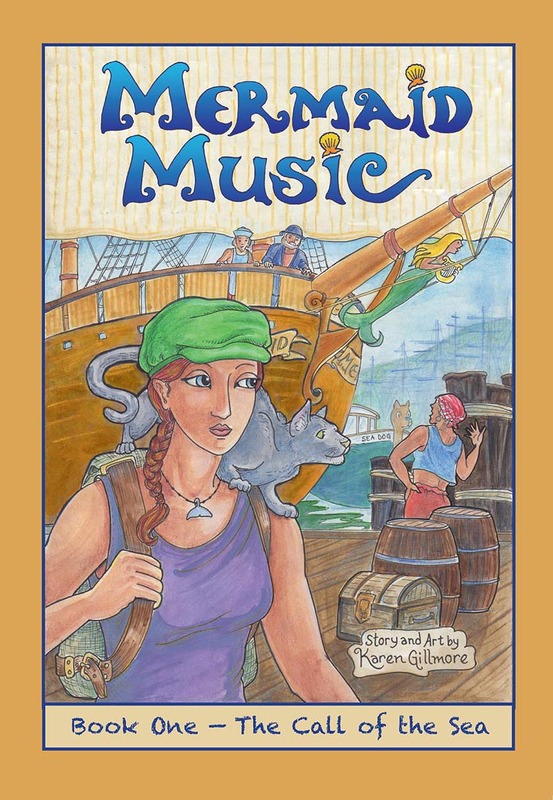 Your main characters should have a recognizable style, that contributes to their personality. I’ve seen so many comics where the artist had one style of drawing characters, and just putting different hairstyles and clothes on the same basic person doesn’t help a whole lot in distinguishing between them! Exaggerate the differences, even to the point of caricature if the style of your story allows it. The contrast between the size of the little girl here and her new riding teacher are deliberately exaggerated to emphasize the little girl’s vulnerability and the teacher’s strength. Miss Ophelia Bluefeather and Mister Cecil Ravensfield — No trouble telling these two apart! Here are some exercises to work on your character design (the first three were ones that were in the class handout). But don’t get too lost in all this fun and forget to work on your comics! Exercise 1: Pick a character type. Keep the category loose, such as “young boy”, “elderly woman”, “working man”, “woman performer”, “grocery worker”… you get the idea. Now draw as many characters as you can think of that would fit in your category. Don’t worry about trying to flesh them out, just get down some rough sketches. Exercise 2: Now pick one of the characters from exercise 1 that you like. Draw him or her in more detail, adding details to the clothing, maybe some tools or accessories that tell more about who this person is. This is where narrative starts — you’ll find yourself making stories about the character as you draw! Exercise 3: For those who like animals, try this: draw as many cat (or dog, horse, whatever) faces as you can on a page, striving to make each one recognizably different. Then pick two, and give them bodies that are instantly recognizable as being different individuals. Exercise 4: Mix things up! “Anthropomorphic” characters have always been popular; think of all those dogs and cats in clothes from early comics and animation. 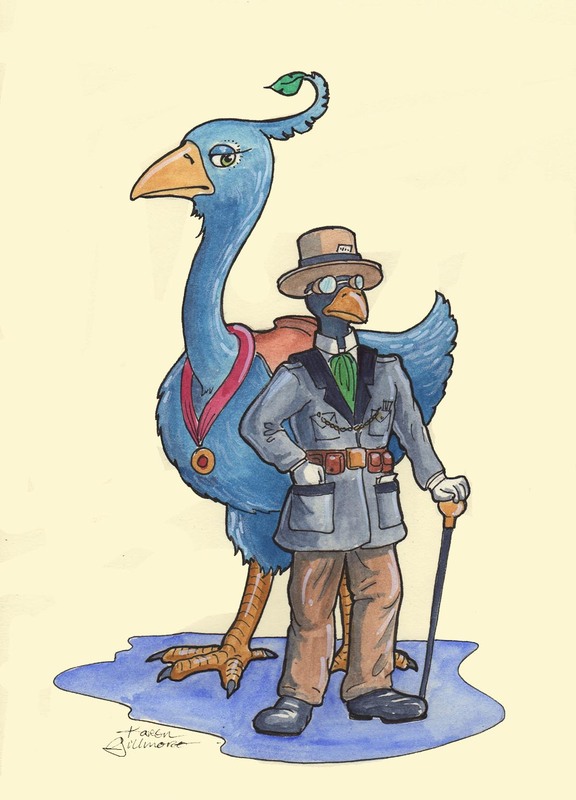 Pick an animal, and an occupation, and design a character around them. One way to take this a bit farther is to add an emotional state, and draw a little one-panel comic showing the character, with props: for example, a bored heron dockworker; a frantic hippo grocery clerk; an angry rabbit disc-jockey. Here’s some examples of some anthropomorphic characters of mine. Exercise 5: After you’ve done your character sheet, try drawing your character in different poses. How does he look when he’s running, jumping, doing the dishes, petting a puppy? How does she look when she’s cooking, giving an impassioned speech, riding a horse, or throwing a punch? Think of some activities your characters will be doing in your story and let them rehearse! Exercise 6: Copy characters from several different comics that you like. Study how the artists did them and what makes them different from each other. Notice what you like about each style. Exercise 7: Make a basic character sketch, then trace it several times. Give your character widely different clothes, hairdo, and a different colour scheme on each tracing. Notice how the different outfits and colours affect your perception of the character. Here’s a fantastic resource: an entire, classic book of character design for animation by Preston Blair (also useful for cartoonists!) online. If you are interested Disney style, this will teach you everything you need to know. Some excellent advice in 20 quick tips from illustrator Jon Burgerman (with which you could practice endlessly!). 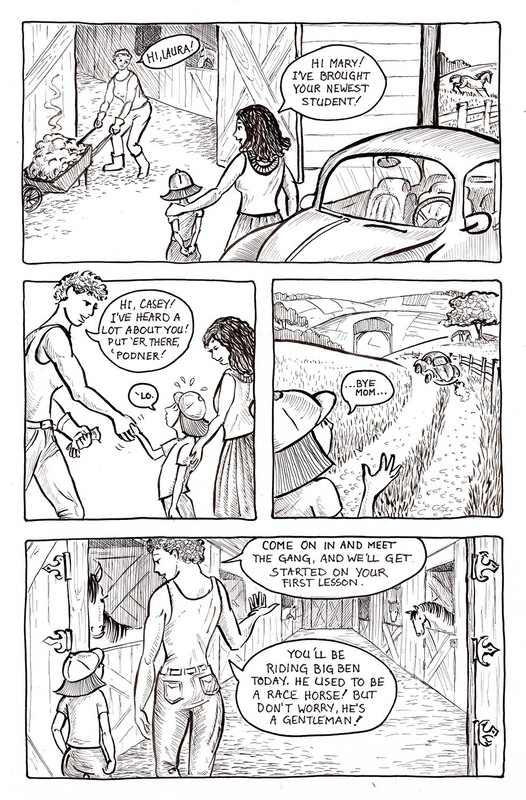 Cloudscape Comics, a cooperative group of comics artists in Vancouver, has a wonderful series to get beginners started. 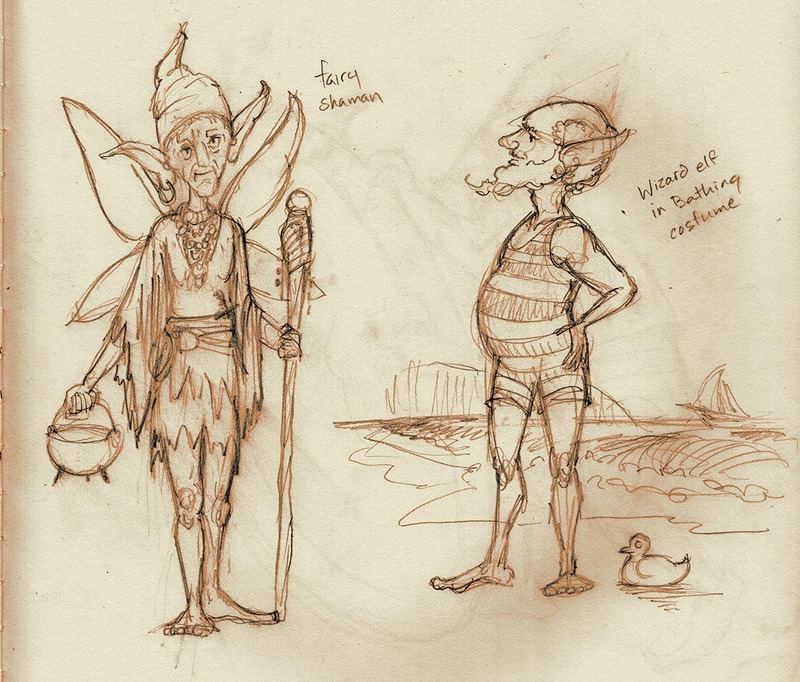 Here’s their page on Character Design. I’ve started a character design board on Pinterest; if you’re a Pinterest fan, check this out from time to time, as I’ll be adding more. I also have a bunch of boards with period costumes that might be useful reference for your characters if they are historical or fantasy! You can also do your own search on Pinterest or Google for “Character Design” and “Character Design Tutorial” — there is so much out there! And one more: if you haven’t yet discovered the work of James Gurney, creator of Dinotopia and long-time National Geographic illustrator, you’r in for a treat. His is my very favourite art blog, with sooooo many categories! Here’s his comics and cartooning category. Glad you liked it — you’re welcome! I always enjoy glimpses into other people’s working methods too. I’m having fun teaching this course and documenting it at the same time.